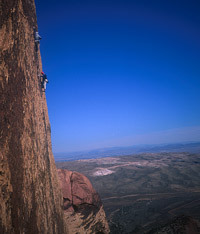 Climbers on Pitch 6 of Levitation 29. With steep, moderate routes, cracks which eat up pro, and tightly bolted face pitches, many long routes at Red Rocks give you high adventure without the runouts so common in many areas. Varnished edges, incut jugs, splitter cracks, technical faces—Red Rocks multi-pitch routes have it all. Bolted anchors on popular routes quicken the pace and allow easy retreat. Red Rocks multi-pitch climbs are just downright fun, but that's only half the story. The canyons of the Red Rocks are blissfully free of traffic noise and the reminders of civilization, and desert bighorn easily outnumber hikers. As you get back in the canyons, you realize the awesome scale of the 3000-foot sandstone escarpment, and how even the very long routes rarely tackle more than half of a wall's relief. During the daytime, Las Vegas remains thankfully hidden away, and only at night, with the glow of casinos on the skyline, do you realize just how close Red Rocks is to Sin City. Yet the huge and rapidly expanding Las Vegas, if not one of the attractions, is one of the main conveniences of climbing at Red Rocks. Cheap airfare, endless neon nightlife, restaurants, coffee shops, supermarkets, libraries, and the infamous Strip—all are only a few minutes away. Even more convenient than the city is the plethora of sport climbing, bouldering, and short trad routes that bring many climbers to Red Rocks in the first place. And with the development of hundreds of sport routes on the limestone in the area, climbers are no longer limited to the often overcrowded, but excellent, sport crags at the start of the Red Rocks loop road. All told, the multi-pitch classics of Red Rocks are uniquely accessible, relatively low on the commitment scale, and undeniably high on the pure climbing fun scale! Here we give you SuperTopo guides of some of Red Rocks' best—including a few never before published routes. Endless seas of perfect incut edges are the hallmark of Red Rocks face climbs, and not surprisingly, when cracks split the rock more edges are usually close at hand. Unlike Yosemite, most Red Rocks crack climbs are actually face climbed while using the crack for protection and the occasional jam. For those not used to sandstone, take some time on easier climbs to get used to the often fragile rock, and above all else, do not climb on the rock in the day or two after a rainstorm (longer if heavy rain), since the rock is significantly weaker when damp. 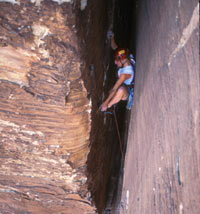 Red Rocks sandstone has many bottlenecks and a good set of nuts, often including doubles, is essential. When cams are used, they are mostly in the thin to hand size (we'll warn you when bigger gear is needed in the guidebook!). 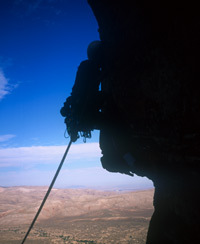 For many of the longer routes, a LARGE number of quick draws and slings are needed—it is common to clip more than 10 bolts on a single pitch. Extra rap slings and rap rings are a good idea for many of the routes, especially for trees and blocks. Most bolted stations have fixed rings or chains which eliminate ugly webbing tangles. You will want a pair of comfortable climbing shoes for the longer routes and a tighter fitting slipper or velcro shoe for the sport climbing. A helmet is a must for both potential loose rock and dropped gear from climbers above. Here's the rack we at SuperTopo bring when we climb at Red Rocks. This is just to give you a general idea of what to bring. 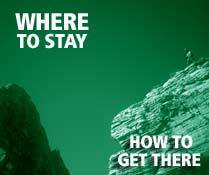 Check to the SuperTopo guidebook before climbing each route to see specifically what you need. Roxanna Brock chimneying on Epinephrine. A good supply of water is key, both for climbing days and for camping. Potable water is available at the campground, but it tastes bad, and if driving, fill lots of water containers up from areas with better tasting water. If the route does not have a lot of chimney, I use a hydration pack. Long pants and good approach shoes or boots are strongly recommended for the often cactus-filled approach trails and the bushwacking descents. Sunscreen and sun hats for warmer periods, and warm gear and rain gear for anytime in the late fall through spring, where you can expect anything from hot periods to rain or snow. Don't forget the headlamp on multi-pitch routes, many people get hung up behind slow parties or take longer on the descent than they expect. A headlamp is essential to get out of the canyons if it gets dark. A small knife is handy to remove old webbing at rappels. A cell phone could potentially save your partners life in an emergency. A small GPS device will help you find the crags and parking. Don't forget the camera! There are a number of easier grade classic climbs that are often the focus of a climber's first week in Red Rocks. We encourage you to check out the FREE SuperTopo we have available for download for Black Orpheus. A selection of Red Rock's best classic climbs are contained in our Red Rocks climbing itinerary pack—these are aesthetic and memorable climbs that climbers of any skill level will find worth repeating again and again. A great first multi-pitch climb with huge ledges, good protection and fun climbing. The last pitch slab is a bit runout but you can rappel before then if you want. Located in Pine Creek Canyon at the Brass Wall, this is a beautiful thin hand crack to a slightly runout easy face..
A great fun crack and juggy face on the Black Velvet Wall near Frogland. Next to Lazy Buttress, this long pitch has awesome face climbing, but it is a bit scary at the startyou can toprope from Lazy Buttress. The classic climb of the area. Great hands on the first pitch, then a short burly fist section followed by lots of stemming and face climbing around a wide crack. At Lotta Balls Wall, this climb has fun 5.7 crack climbing with a bolted 5.8 face section, which is slightly runout, but you can rap if it looks intimidating. It's hard to believe that the steep, dark, and ominous dihedral of Dark Shadows is rated only 5.8. The route is capped by a huge roof and has walls so black and polished that they shine. Once warmed up to Red Rocks climbing, you may want to expand your tick list to the climbs listed below. All of these climbs are part of Red Rocks Climbing guidebook. This fantastic route is sustained at 5.8. 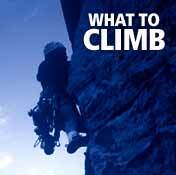 There are many bolts when the climbing gets wide, which allows you to venture onto the face. This challenging 5.8 is sustained with a great variety of climbing and a short approach. One of the longest and best routes in Red Rocks, and certainly one of the best 5.9 routes in the world, Epinephrine is huge and forbidding. Black Orpheus ascends a break in a huge overhung headwall via a cleanly fractured dihedral and has some of the best moderate crack climbing at Red Rocks. With varied climbing, tons of thin cracks, tightly bolted face climbing cruxes, and an intriguing traversing roof to crack, Sour Mash is endless fun. Long and sustained, Dream of Wild Turkeys tackles discontinuous features for over 1000 feet of amazing climbing with nearly every pitch 5.9 or 5.10a. Amazingly sustained perfect edges up pitch after pitch of sport bolted face. Fun bouldering abounds at Red Rocks. Ask at Desert Rock Sports for detailed beta on where to go. The Craft Boulders in Calico Basin located off of Highway 159 are popular. There are some mellow, but good boulders at the Willow Springs Area—you can't miss them as they are right in front of the second parking area and the hoards of tourists. Beware of cactus on all approaches! 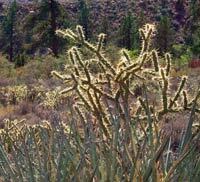 Red Rocks is a desert ecosystem, and while the thorn and spine-barring plants may look (and feel!) formidable, care should be taken to reduce your impact. The number one way to do that is to stay on the main trails and avoid lesser traveled trails—even backtracking if needed. Bighorn sheep, peregrine falcons, and many other animals inhabit the canyons—respect them in their home. Unfortunately, the real environmental issues with Red Rocks are outside its boundaries and obvious to anyone who goes to Las Vegas more than once. The city is exploding in size and threatening to develop every scrap of land that it can get, somehow securing enough water for wasteful practices like man-made lakes in the middle of some of the suburbs. The hill across from the canyons, Blue Diamond Hill, has been the home of a gypsum mine for as long as anyone can remember. While the giant blasting (2 p.m. on Wednesdays usually) is annoying, the hill has blissfully blocked Vegas from view from most of Red Rocks. Unfortunately, this is likely to change, and unless enough pressure is put on the local government entities, high-end housing, golf-courses, gated communities, and Wal-Marts are only a few years away. 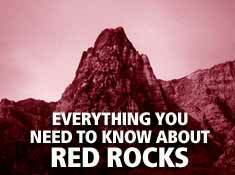 See www.saveredrock.com for more info on how to help preserve Red Rocks. Until just a few years ago most bolts on longer Red Rocks routes were terrible 20-year-old 1/4 bolts. Dan McQuade and friends spent a ton of time and energy replacing key anchors, and then in the last couple of years SuperTopo's own Greg Barnes, the Director of the American Safe Climbing Association, spearheaded rebolting efforts that have replaced 350 bolts on classic climbs in the canyons, including most routes covered in this SuperTopo guide. Please donate to the ASCA, a 501(c)(3) nonprofit, as they don't yet receive enough support from the climbing community to keep up with all the bolts that need to be replaced! Even at big discounts below wholesale, on average a new camouflaged 1/2 stainless bolt for replacement in Red Rocks costs the ASCA about $7. On just two routes, Prince of Darkness and Eagle Dance, the ASCA replaced 129 bolts, costing nearly $1,000 in hardware alone! For the most up-to-date information on each routes anchors conditions, visit the ASCA web site at www.safeclimbing.org. Mt. Wilson as seen from Highway 159. In the sections below, we attempt to list information that will help ensure that your climbing trip to Red Rocks is enjoyable and hassle-free. Car Travel Red Rocks is just west of Las Vegas and can be accessed from various points in Vegas, and from Highway 160 from the Death Valley area. From almost any direction it's fastest to take the main Interstate highways into the city, although on weekends the traffic from LA can actually have endless traffic jams across the desert from the west (a LOT of people gamble). Despite what you'd expect from a map, if driving from the Bishop area it's actually much faster to take Highway 168 from Big Pine across Westgard Pass into Nevada, then down Highway 95. However, the views through Death Valley National Park, especially in late fall, winter, or early spring, are definitely worth seeing, and many people will want to spend some time viewing the Park. Air Travel Las Vegas' McCarran International Airport is one of the easiest, and cheapest, places to fly to in the world. However, huge conventions sometimes clog the airlines, drive prices through the roof, and fill up every hotel room. Plan ahead. Loop Road Climbs accessed from the Loop Road have very limited parking hours. If you are staying after hours, and wish to avoid a $120 fine, call the late exit number 702-515-5050, where you must give detailed information on your car, the number of people, the route you're climbing, and emergency contacts. Late exit passes are only available for long routes in the canyonsnot for sport climbing, bouldering, or hiking. Don't try to abuse the system. You WILL get fined, every time, for being in after closing with no pass (although it takes them a while to work around to the end of the loop). The pass only allows a few extra hours, and if you are still not out, you can get fined even with the late exit pass. The longer routes at Red Rocks are in the canyons and are usually too cold in the dead of winter. The best seasons are fall and spring, although south-facing routes are sometimes too hot (and therefore climbed even in midwinter). Current weather should be monitored, as cold or hot spells can change your plans. Even in warmer spring and fall periods, cold storms happen regularly, and the sport, short trad, and bouldering areas of Calico Basin are often perfect when the canyons are stormy or drying out after a storm. Several local limestone areas are also perfect alternatives, and for truly desperate days, Red Rock Climbing Center (next to Desert Rock Sports) offers indoor overhung leads and hot showers. June through August are usually so hot that no one dares climb even in the coldest canyons, and air temperatures well above 100 degrees are common. Greg Barnes on Triassic Park. The only campground, the BLM 13 Mile Campground, is located on West Charleston (Route 159), 0.5 miles from Calico Basin Road. It has over 70 sites but it is difficult to find a spot in prime season. Both drive-in and walk-in sites are $15 (two cars allowed per drive-in site but only one per walk-in). Large groups should reserve some of the group sites, which are only $40 a night for up to 8 cars and 15 people. Drive slow in and around the campground: speed traps and $250 speeding tickets are common. These sites are often reserved half a year in advance for peak times. 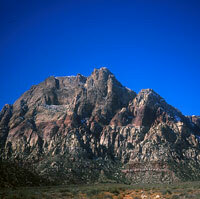 Call the Visitor Center at 702-515-5371. If full, you can drive about 25 miles to Lovell Canyon where there is free camping with no facilities. From the junction of Highway 160 and 159, drive west on 160 for 12.6 miles and turn right on Lovell Canyon Road (which is about 5 miles past Mountain Springs Summit). Vegas hotels or a long drive to the west to find a camping spot are the only options. If you can sleep in your car, the back lots of many large casinos are usually hassle free. It is illegal to camp at the trailhead for Black Velvet Canyon or anywhere in that area. There are endless restaurant options all over the place in Las Vegasthe main concentrations of eateries near Red Rocks are along Charleston and Sahara, and Rainbow which runs perpendicular to the two. There is a Trader Joe's at 7575 W Washington Ave and 2101 S Decatur Blvd. There is a Whole Foods with WiFi at 8855 W Charleston Blvd Several brand-new large grocery stores are on Charleston near Red Rocks. By the time you read this there will be even more so take your pick. There is a Starbucks inside every one, and there is a Starbucks outside in the strip mall in front of every one as well. We are not joking. At the intersection of 159 and 160 near Blue Diamond (on the way out to Black Velvet Canyon from the campground) is a Rebel Gas Station with an OK selection of food and supplies. Carry lots of water especially on the south-facing routes, dehydration is no fun, and it impairs judgment. Water can be had at the campground, the visitor center, or can be bought at stores. None of it is of great quality, so stock up ahead of time if you can. The closest free WiFi to Red Rocks is 6 miles east at Coffee Bean & Tea Leaf at 10834 Charleston Blvd. Continue another two miles east and there is free WiFi at Whole Foods at 8855 W Charleston Blvd. Sahara West Library (9600 West Sahara Ave.; 702-507-3630,) is at the corner of Grand Canyon and Sahara and has free WiFi and 27 Internet terminals that you can use for free for an hour, but amazingly they are all filled much of the time. It also has a discarded book sale room out front where you can pick up great reading material for either 50 cents or a dollar. Jackson Hole Mountain Guides in Red Rocks: 800 239-7642 or 702-254-0885. Desert Rock Sports (8221 W. Charleston Blvd. ; 702-254-1143), on Charleston as you drive into town, is a full-service climbing shop with a huge selection. Red Rock Climbing Center, located in the same building, is a good option for rainy days and also offers affordable showers. Las Vegas is a big city with big city crime. Never leave your wallet in your car, conceal valuables, and be especially careful at the trailheads to canyons. If possible, make an effort to conceal any evidence that your car belongs to a climber. Thieves specifically target climber cars because they know they will be gone all day. A common trick is to break into a car, find a wallet, remove a single credit card, then carefully lock the car back up. By the time you figure out that a card is missing, thousands of dollars of bills have been rung up at local casinos. Also, it is not uncommon for valuables like mountain bikes to be simply ripped off of locked racks on the car, sometimes leaving parts of the fork behind. Camping near the city to the west along 160, which is a heavily traveled road to the satellite town of Pahrump, runs the risk of violent crime and should be carefully considered. Gun shells litter the campsites, and most sites near the road are illegal to camp at. A tarantula will only bite if threatened! Be very careful around the abundant cacti and sharp desert vegetationa glance will tell you that the plants in Red Rocks know how to defend themselves. Rattlesnakes are not common but they do occur. 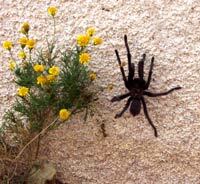 Scorpions and tarantulas and wasps are likewise all present but rare. Peregrine Falcons nest in the canyonsdo not disturb them if you see them (they are bold and have a history of attacking climbers, so it's not just for their protection!). Please give Desert Bighorn sheep a wide berth in the unlikely event that you see them up close (half a mile away up a 5th class wall is more common). The human zoo of Las Vegas, especially the Strip, must be viewed at night. Roller coasters, pirate shows, fountains, and endless extravagantly decorated casinos, it reminds you of a modern version of the orgies of the Roman Empire in its heyday. There are so many lights in Vegasespecially the one out of the top of the Luxor's black pyramidthat Las Vegas is the most intensely bright spot on earth as seen from space. Check out The Strip Podcast's Top Secret Tourist Tip of the The Week for local knowledge on the best shows and deals in Vegas. For a totally different experience, there are many excellent hikes in the Red Rocks, especially Bridge Mountain. Those with mountain bikes can explore the big new array of trails out near the entrance to Black Velvet Canyon. The Springs Preserve is a 180-acre non-gaming cultural and historical attraction designed to commemorate Las Vegas' dynamic history and to provide a vision for a sustainable future. The Red Rocks of Southern Nevada by Joanne Urioste has detailed written information on many canyon routes not covered by any other guide. Red Rock Odyssey by Larry DeAngelo and Bill Thiry - This great read captures the history, beauty and adventure of Red Rocks climbing.